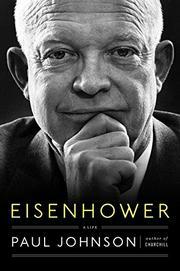 When he left office in 1961, historians considered Dwight Eisenhower (1890-1969) a second-rate president. His reputation’s steady rise is not interrupted by this admiring, opinionated account by veteran British journalist and historian Johnson (Mozart, 2013, etc.). Although he remained in the United States during World War II and spent two decades in the shrunken peacetime Army, Eisenhower’s talents were well-known. Gen. Douglas MacArthur kept him as an aide for nine years, and George Marshall summoned him to Washington a week after Pearl Harbor. Commanding the largest military force in history (20 times the size of MacArthur’s), Eisenhower kept Allied generals focused on the effort against the Nazis, even when they were often fighting among themselves. Victory made him a national hero, and he easily won the 1952 election over Democratic nominee Adlai Stevenson. During the 1950s, the prospect of World War III seemed imminent. Several joint chiefs wanted to get on with it, but Eisenhower kept the military firmly under his thumb. He receives credit for ending the Korean War but little for refusing to strike back at China’s threats to Formosa; his military advisers were raring to go. Despite national panic that followed the Soviet Union’s launch of Sputnik in 1957, Eisenhower quashed efforts to launch crash military programs. John F. Kennedy, a far more aggressive Cold Warrior, spent the 1960 campaign denouncing Eisenhower for underestimating the communist threat. Johnson astutely points out that Eisenhower enjoyed being president since, unlike generals Washington, Jackson and Grant, his best qualities were not those of a warrior but a staff officer: efficiency, administration, economy and flexibility. A 120-page monograph cannot replace a complete biography, the best being Jean Edward Smith’s Eisenhower in War and Peace (2012). Though Johnson’s well-known right-wing views deliver an occasional jolt, this book remains a thoroughly entertaining introduction.